By nature, men are hunters and women gatherers, right? Well, we swapped jobs. Although, to my knowledge, my husband doesn't gather much at the moment. Good so because I am hunting. Houses. We want to move to a bigger place since prices have dropped by about 50% here in Dubai since the economic crisis that started two years ago. House hunting is a full-time job: checking property ads, speaking to estate agents, seeing houses, negotiating prices and conditions. Quite a hectic life compared to my otherwise well-organized days as a gatherer (e.g. foods in the supermarket, dirty clothes from various rooms, kids toys when tidying up the house in the evening). So hectic that I sometimes don't find time to eat. Hunger comes when I relax in the evening on the sofa, in form of sugar cravings. In fact, truffle cravings. To me, dates, coconut and pistachio kernels are three of the most commonly used and popular ingredients here in the Middle East. I love each single one of them. 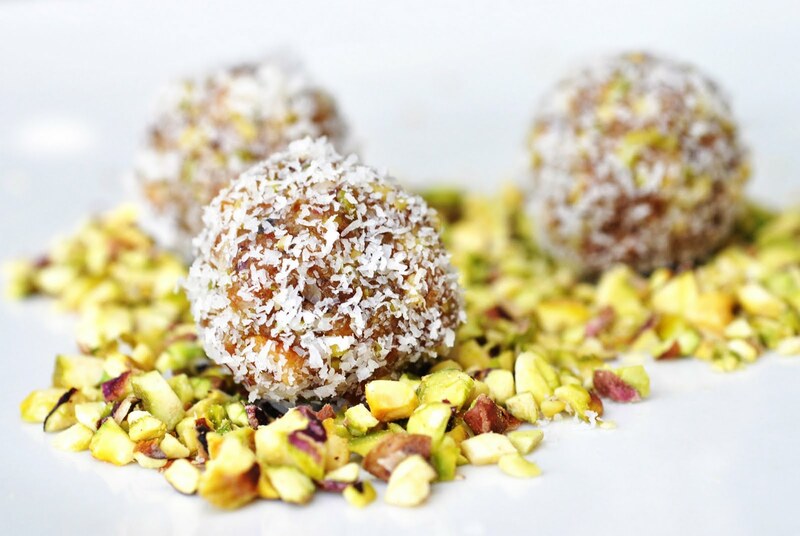 Combine them raw and there you are: it doesn't need more to get some tasty truffles that fulfill any sugar cravings. They are vegan, they are raw, they are quick and easy to make. After dinner sugar cravings don't have to be a bad thing with these!! If the dried dates are too dry and hard, soften them by pouring boiling water over them and soak for 10-15 minutes. Drain excess water. Combine all ingredients in a food processor. Blend until ingredients stick together. Add more coconut oil if the batter doesn't hold together. Form balls of the size of a cherry or walnut. Roll each one in your preferred coating. Keep in mini paper muffin liners. Store in airtight container at room temperature.